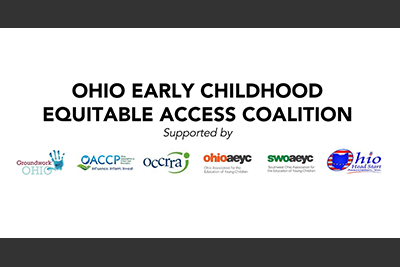 Southwest Ohio AEYC is proud to support the Ohio Early Childhood Equitable Access Coalition! Groundwork Ohio, the Ohio Child Care Resource and Referral Association (OCCRRA), Ohio Association of Child Care Providers (OACCP), Ohio Association for the Education of Young Children (Ohio AEYC), and Southwest Ohio Association for the Education of Young Children (SWOAEYC) announced the formation of the Ohio Early Childhood Equitable Access Coalition, a coalition of early childhood educators unified behind a common policy agenda and committed to mobilize stakeholders behind shared priorities to advocate for increased quality and access to early education programs in the FY20-21 state budget and beyond. Read more about SWOAEYC Advocacy & Policy here.